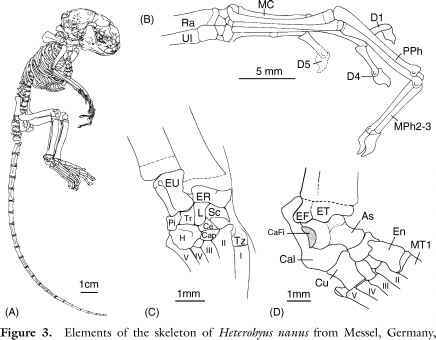 The core of the primatomorph hypothesis developed by Beard (1990, 1991, 1993a,b) was the interpretation of paromomyid phalanges and carpal characters as reflecting a gliding adaptation similar to the peculiar finger-gliding adaptation of living colugos (dermopterans), and homologous with it. However, several papers since 1990 have raised doubts concerning this interpretation. 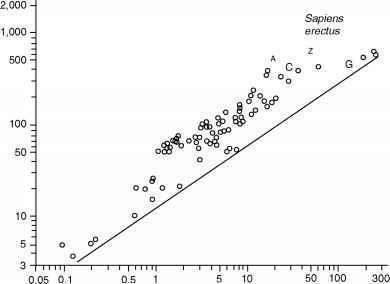 Krause (1991) questioned the allocation of the isolated middle phalanges to the hand or foot of Phenacolemur; however, Beard (1993b) answered that question by quantifying the elongation of isolated middle phalanges. Later, Runestad and Ruff (1995) showed that the humerus of paromomyids does not present the distinct diaphyseal dimensions found in living gliding mammals. Szalay and Lucas (1996) noticed that the associated metapodials were lacking the two articular lobules of living colugos. More recently, Hamrick et al. (1999) found that the intermediate phalanges of paromomyids "are similar in their relative length and midshaft dimensions to those from the hand of vertical clingers (e.g., Tarsiusand Glaucomys) as well as those from the foot of Cynocephalus" (p. 408). They conclude that the "existing phalanges of paromomyids, ..., therefore provide no conclusive evidence that paromomyids possesed a colugo-like patagium" (idem, p. 409). Hence, arguments have accumulated against the view of paromomyids as finger-gliders. redrawn and slightly modified from Koenigswald (1990). Whole skeleton (A); Right hand (B) with extremities of radius (Ra) and ulna (Ul), carpals, metacarpals (MC), proximal phalanges (PPh), middle phalanges (MPh), and distal phalanges (D); numbers refer to digits 1-5. The proximal part of a right hand (C) shows the extremities of radius (ER) and ulna (EU), the proximal carpal row reinterpreted as scaphoid (Sc), lunate (L), triquetrum (Tr), and pisiform (Pi); the second carpal row with hamate (H), capitate (cap), centrale (ce), and trapezium (Tz); metacarpals are numbered from I to V. On the proximal part of a right foot (D), a piece of bone is reinterpreted as being possibly the extremity of the fibula (EF), which would slide on a calcaneofibular facet (CaFi) on the calcaneum (Cal). The astragalus is "As" and cuboid "Cu." Note the curved calcaneocuboid contact, suggesting the presence of some kind of pivot joint, and the relatively large entocuneiform (En) and first metatarsal (MT1), which suggest some hallucial opposition. The long hand and especially long, straight, middle phalanges of Heterohyus are believed to be a good analog for those of paromomyids. convergent with Daubentonia and Dactylopsila (two taxa not present in the comparative tables of Beard, 1993b, and Hamrick et al., 1999). Because of the peculiar preservation of Messel skeletons, slightly crushed, there are some details of phalangeal anatomy that cannot be checked. They should become available on the beautiful material recovered by Bloch and Boyer (2001). The possibility that Heterohyus might have had a patagium needs to be briefly addressed; however, it seems unlikely given the way the two Messel specimens are preserved. On Messel bats the wings are often visible and a large patagium should be recognizable on a Messel glider (three specimens). Von Koenigswald (1990) rejected a patagium in Heterohyus based on the extreme elongation of only two digits, whereas more digits should be elongated to support a gliding membrane. Overall, the convergence put forth by von Keonigswald seems to be quite a convincing one. The author proposes to extend the same convergence to paromomyids, which also have very similar elongated incisors and presumed insectivorous adaptation (with variations; Heterohyus might have been partially wood boring and the apate-myid Sinclairella much more, its incisors being convergent on those of Daubentonia). Because a number of the morphological peculiarities, functionally related to gliding in living colugos, are lacking in paromomyids, vertical climbing and clinging in trees seems a much better explanation for their peculiar extremities. The new material of apatemyids and paro-momyids (Bloch and Boyer, 2001) should provide conclusive evidence concerning this.